Kurt Cobain was the lead vocalist, guitarist, and songwriter for the 90's grunge band, Nirvana. He became a music legend. Even after his suicide in 1994, Cobain continued to inspire his fans. Here is a brief bio on his tragically short life and some of Kurt Cobain's guitars and gears he played. Kurt Donald Cobain was born in Hoquiam, Washington on February 20,1967. Cobain grew up in the working class logging town of Aberdeen, Washington. The area he lived in was nicknamed "felony flats. "​ His parents divorced when Cobain was 8, he was then shuttled around to live with different family members, which created a rebellious attitude. At the ag​e of 14, Cobain got his first guitar, a used electric, from his uncle. 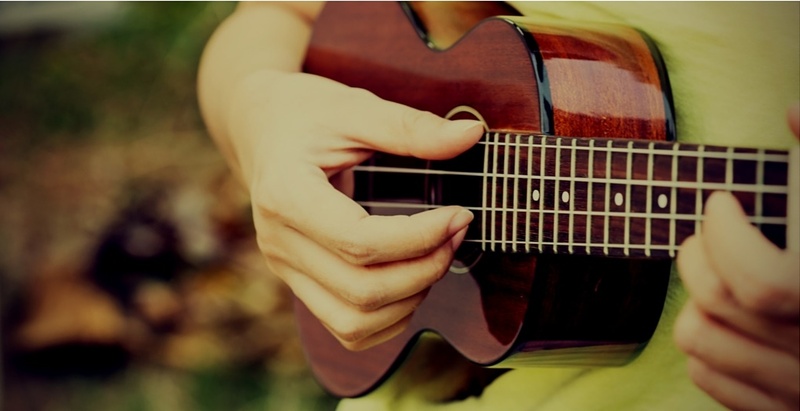 "As soon as I got my guitar, I just became so obsessed with it," Cobain told Michael Azerrad. "I don't think it was even a Harmony. I think it was a Sears." Cobain dropped out of high school during his senior year. He started frequenting local bans, like the Melvins. Here, he met bass player Krist Novoselic. ​In 1987, the band Nirvana was formed. The band's first album, Bleach, was released in 1989 with a independent label Sub Pop. ​In the late 80's, Cobain developed a heroin habit, which escalated when he met Courtney Love from the band Hole. Due to Nirvana's success, the relationship between Love and Cobain was closely followed by the media. Love became pregnant with daughter, Frances Bean Cobain, and the couple married in February of 1992. The album In Utero hit number one in 1993, bringing an increasing amount of fame to the band. Cobain's drug addiction was well known and even discussed in a magazine article. This led to custody battle with child services. ​The same year the police were brought to the couple's house on numerous occasions for domestic abuse, drugs, and weapons. In March of 1994, Cobain was on tour with Nirvana in Europe and overdosed. He was in a coma for 20 hours and went through a number of detoxes and interventions. On March 30th, Cobain was checked into the Exodus Recovery Center in Los Angeles, but he left the facility the next day and went missing. Cobain had returned to his home in Seattle where he committed suicide with a self-inflicted gunshot wound to the head. ​His shocking death led to many conspiracy theories, including whether it was murder if Love was involved. What about Cobain and his guitars? Cobain has been known to be the opposite of a guitar snob. This can be attributed to his poor upbringing and lack of money growing up. "Junk is always the best," Cobain stated to Jeff Gilbert in 1992, "I use whatever I can find at junk shops." Even when Nirvana was a huge success, he would continue to use budget guitars and what he could find at pawn shops. Cobain was known for smashing up guitars beyond repair, as you can imagine, he went through a LOT of guitars. One of the first guitars he bought (seen in photo to the right) was a Univox Hi-Flier Phase 3. It was likely manufactured between 1974 and 1977. The Hi-Flier went with Cobain on all of his early Nirvana gigs up until 1988. This was presumably the first guitar he ever destroyed on stage. Kurt used an Epiphone ET270 in early 1990 until April 26,1990. It was featured in the In Bloom music video. ​If you fast forward to minute 2:20, you can see the Epiphone ET270. Cobain was left handed, but mostly used right handed guitars in his early years. This is most likely due to the easy availability of cheap right handed ones. His first left handed guitar wasn't until 1990, with a Fender Stratocaster. The white Japanese-made guitar made it into 1991, but no one knows exactly what happened to it. A number of 1990 Fender Stratocasters were used specifically for smashing at the end of concerts. One of Kurt Cobain's guitars that was most iconic was the 1965 Fender Jaguar. It made it's debut in the summer of 1991 while Nirvana was recording Nevermind. I can only imagine how shocked Cobain was when Fender approached him about designing a guitar. In 2011, Fender released a Kurt Cobain guitar, modeled after his '65 guitar, the Fender Kurt Cobain Jaguar NOS 3. The 1969 Fender Competition Mustang is best known for it's appearance in "Smells like Teen Spirit. The Mustang was one of Cobain's favorite models and he avoided using it at bigger concerts, probably because he didn't want to destroy it. This guitar was also used at a gig in Dallas at the Trees Club on November 19th, 1991. After finishing the song "Polly," Cobain smashed a monitor console that severely damaged the Mustang. He then switched to his Jaguar. This gig was famous because a couple minutes later he jumped into the crowd and when he was trying to get back onstage hit a bouncer in the face leaving him with an open wound. The bouncer waited until the end of the show to catch up with the band to retaliate. The bouncer supposedly broke the cabs windshield to try to get to Cobain. Fortunately, the bouncer was pulled off of him. Kurt Cobain's guitars were numerous. There are so many guitars that he played and/or ruined while he was alive. These are just some of the highlights. If you want a completely comprehensive list take a look at the Kurt Cobain feature in EquipBoard. ​Kurt Cobain left a legacy behind him. 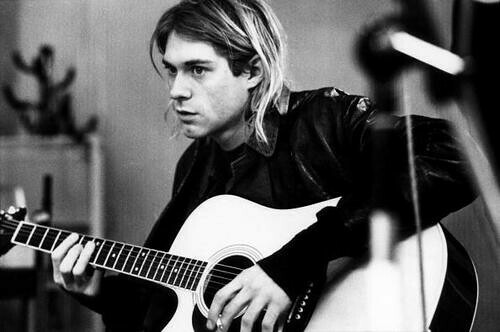 Shortly after Cobain's death, the band released Unplugged in New York, which went to the top of the charts. Two years after his death, From the Muddy Banks of Wishkah was released and the group scored another huge hit. Nice website! As a huge Kurt Cobain fan, I couldn`t agree more with you!